Michelle Kopp and I go a long way back. Our families vacationed together a-many-a summers in the cabins of Beaver’s Bend State Park in Oklahoma. Michelle’s family moved from East Texas to Louisiana when we were in high school. She married a pastor and they serve together in Galena, Alaska. It is such an honor to have her as our guest post today as she shares her story of experiencing God as the Provider. You can read more stories from Michelle on her blog. Galena, an Athabaskan Indian village in rural Alaska, is closer to the Arctic Circle than the nearest road. The village sits right next to the Yukon River, a powerful river, a mile wide in some areas, which is frozen during winter, and breaks up in May transforming our world from winter to summer. We’ve called Galena home the last three winters. Why are we there? Well, that’s another story for another day. Today I want to tell you how blessed we are to have a heavenly father that is a kind, gentle, and caring Provider. Galena began flooding Sunday May 26th. 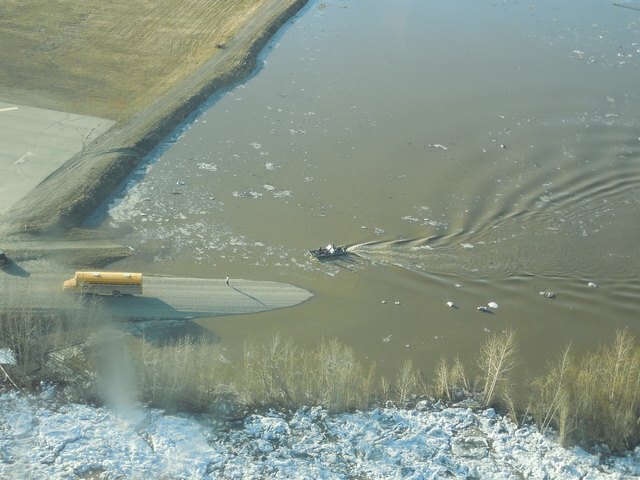 The water rose 12 feet in 12 hours as an ice jam down river blocked the normal flow of water. I don’t think I’ll ever forget that day. On the 27th, we saw the water rise 6 feet in 30 minutes. We evacuated our home by canoe to the city school. It was there that my husband decided to stay and help while the kids and I were boated across town to the airport along with elders and other women and children. Missionary pilots flew in and rescued the women and children, risking their lives to land on a runway protected only by a 20 foot dike which was completely surrounded by water and ice right up to the top but not yet pouring over. In the course of 24 hours everyone who wanted to evacuate was flown out without injury or casualty. The Lord provided safety for our village. This is our house and garage, and the blue is the top of a Ford Explorer. 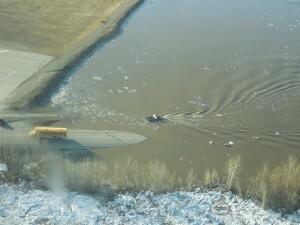 How we boated to the dike road around the airport. In Fairbanks, we spent the next few days praying and trying to wrap our minds around what had just happened. 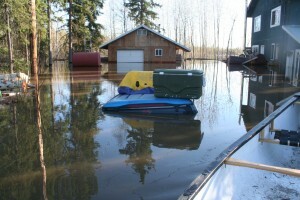 The Lord’s people in Fairbanks provided shelter for my family. We shared the space with a few other families from Galena, and helped care for one another disciplining our children together, cooking and cleaning together. We helped each other make decisions about what would be the next step for each of us. The Lord provided friendship and community. We had escaped Galena with very little, and we had great need. After asking for help, we began receiving immediately. My friend and I sorted through boxes of donated clothing items, making piles for each of the 8 children staying there. As we opened a fresh box, my friend held an item up and called my name. And that’s when my joyful tears began to flow, and then the squeals of delight rang out as my daughter set her eyes on the item. 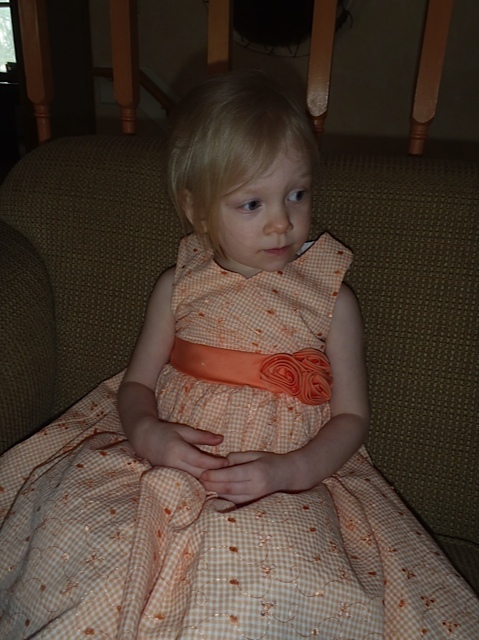 Just so you understand, my daughter, age 3, delights in dresses of all kinds and wants to wear one every day, but her very favorite was a peach colored dress. From the day she received it last spring, she wore it every time it was clean. However, when we evacuated, we left it behind. And now we assumed it was destroyed as the water had overtaken our home. We had no idea the extent of the damage. The item pulled from the box, a peach colored dress just the right size for my daughter, was an exact match to her favorite dress that was left behind. In that moment I realized that this was a special gift from the Lord. Our Cara in her peach dress. Question: How have you experienced God as Provider? Leave a comment and share your story. I do love this post. So many things have happened to these girls in their adult life. Many challenges and many many different ways to minister to so many. Their love of God is so special.